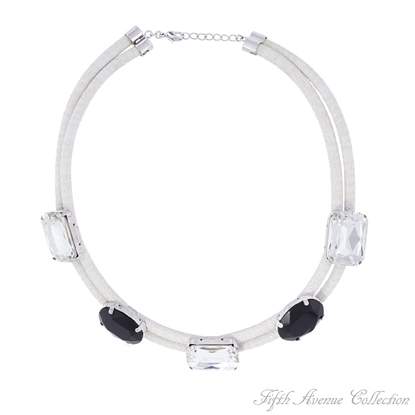 Our "Leading Luxury" neckpiece finished in rich rhodium is exceptional glamour at its finest! 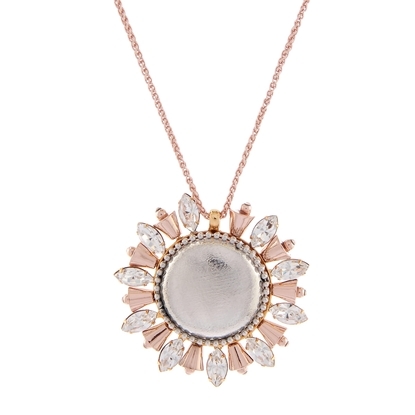 Boasting luxurious detachable pearl enhancers suspended from a AAA cubic zirconia encrusted circle pendant, this must-have design is the perfect option for day or night! 30" neckpiece plus 2" extension. Nickel and lead free jewellery. 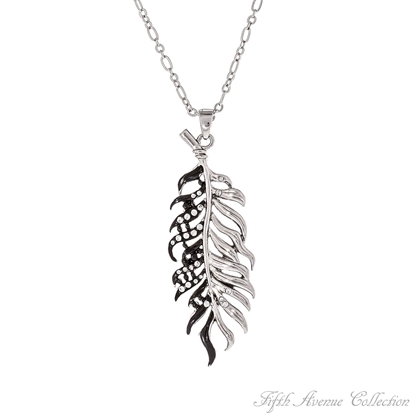 Leaf it to Fifth Avenue Collection to design a replica of Mother Nature's beauty with this lovely silver and black enamel leaf neckpiece that sparkles with Swarovski crystal. 26" neckpiece with 2" extension Nickel and lead free. 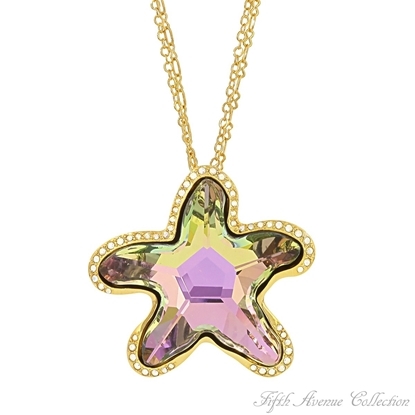 How many "Light Years" has this gorgeous starfish, brilliant with Swarovski's aurora borealis crystal, flashed on an ocean shore before it charmed its way into your jewellery collection? 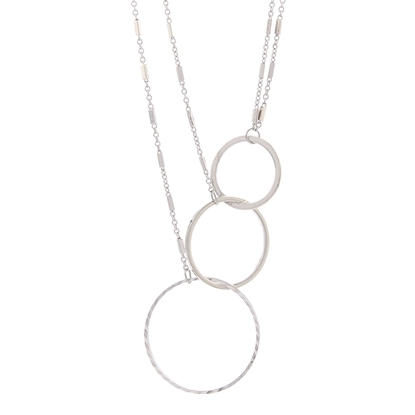 30" neckpiece with 2" extension Nickel, lead and cadmium free. Here’s a “Little Sunshine” that you can’t help but feel happy wearing! Clasp on this image of a beautiful butterfly, encrusted with dozens of brilliant AAA cubic zirconia that dallies from a delicate silvery chain.16” Neckpiece with 2” extension.Lead and nickel free. With her golden hair and beautiful crystal wings, this “Littlest Angel”, dressed in a smooth finish of rich rhodium, is sure to be number one on every woman’s gift list. 24” neckpiece with 2” extension. May also be worn as a pin. Nickel and lead free. 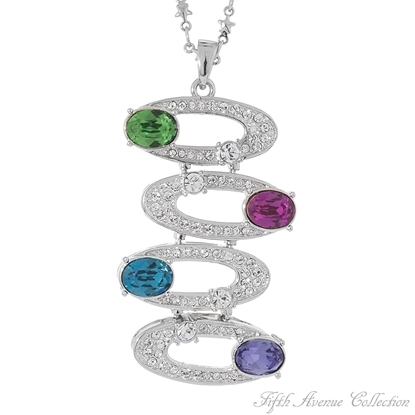 A colorful swirl of Swarovski crystal sparkles with delight in a popular hematite finish. 18" Neckpiece with 2" extension Nickel and lead free. Get in touch with your wild side with this gorgeous, sly representation of nature's most popular vixen. Adorned with Aurora Borealis crystal eyes, a clear crystal nose, and languid stripes of glittering silver diamond dust offset by lustrous black enamel, this household jewel denotes an exotic and wild appeal. 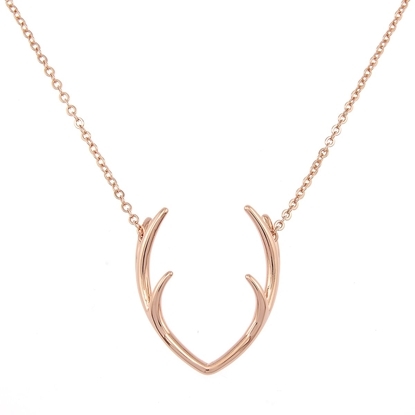 Beautifully paired with a delicate, rose gold, cable link chain, this pendant adds a touch of personality to your creative style sense. The light weight layering of Fifth Avenue Collection's "Lost in Paradise" neckpiece delicately draws the eye, complementing your décolletage. Multiple fine hematite finished strands are dressed with tiny rhodium finished beads and smooth cylinders to create the perfect, chic statement piece. 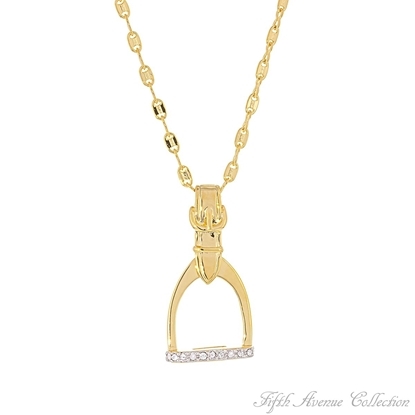 Show your devotion this Valentine’s Day with Fifth Avenue Collection’s “Love Struck” pendant. 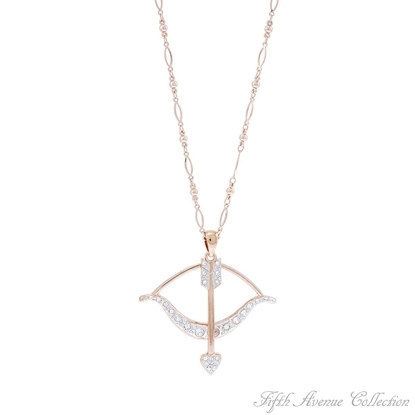 Suspended from a 30 inch stylized chain, this divine piece features a gorgeous rose gold-finished bow and arrow set illuminated by stunning Swarovski crystal accents. 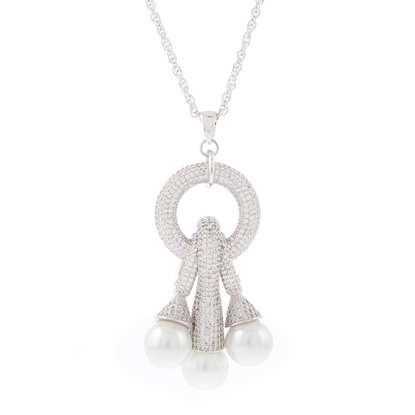 Perfect as a gift, or to sport your own affinity for love, this piece is a timeless Cupid keepsake. 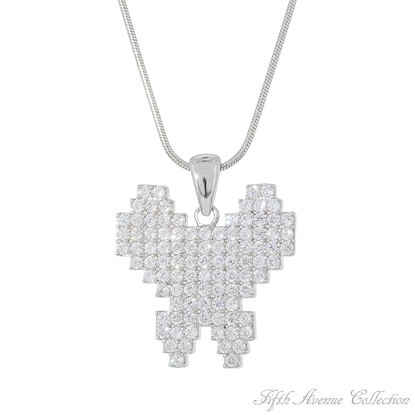 Show your devotion this Valentine’s Day with Fifth Avenue Collection’s “Love Struck” pendant. Suspended from a 30 inch stylized chain, this divine piece features a gorgeous rhodium-finished bow and arrow set illuminated by stunning Swarovski crystal accents. 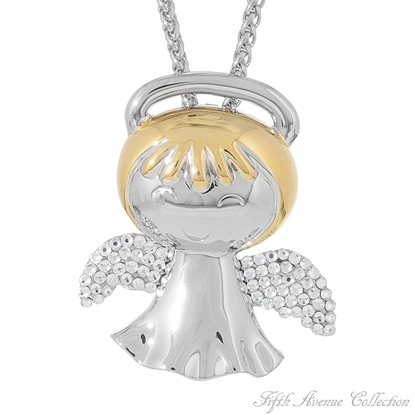 Perfect as a gift, or to sport your own affinity for love, this piece is a timeless Cupid keepsake. 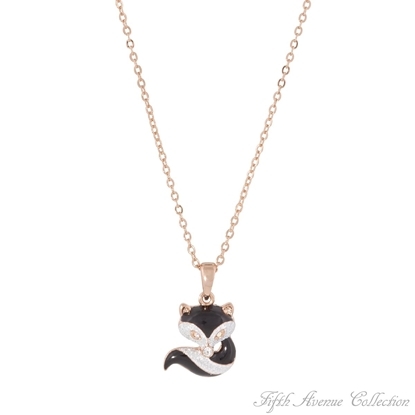 Fifth Avenue Collection has added to its fine Infinity Collection with our stunning “Luxurious Rose” neckpiece. 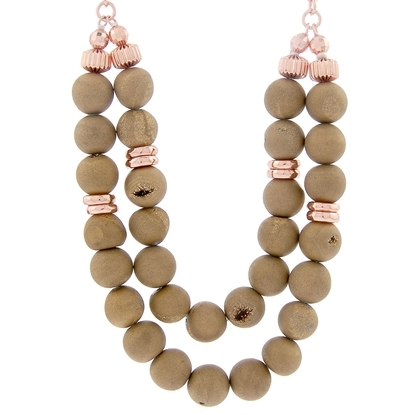 Boasting a perfect balance of superior style with elegant whimsy, this design features oversized links of stylized rose gold curb link chain, accentuating a myriad of polished ball pendants and light topaz colored bead clusters. A large, luxe and lavish addition to your jewellery collection, this limited edition promises to become a timeless classic that will never go out of style. A two-inch extension is attached for perfect placement. 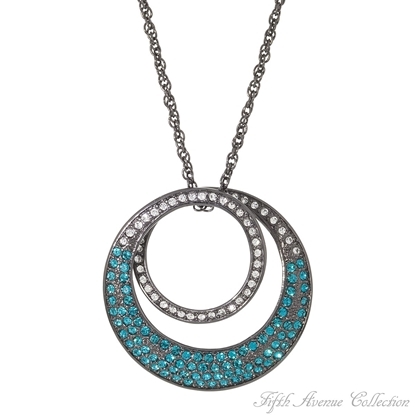 Fluid and bright, this gorgeous neckpiece brings movement and life to your look! 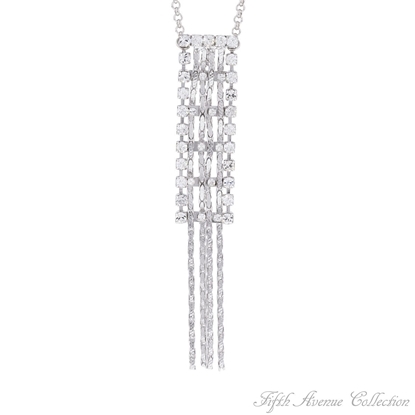 Suspended from a long, rhodium-finished cable link chain, a rectangle of Swarovski crystals marries lustrous, metallic edge with woven strands of supple chain. Flexible and fantastic, this high fashion piece moves with your body to shimmer and shine and bring a sultry softness to high fashion glamour. 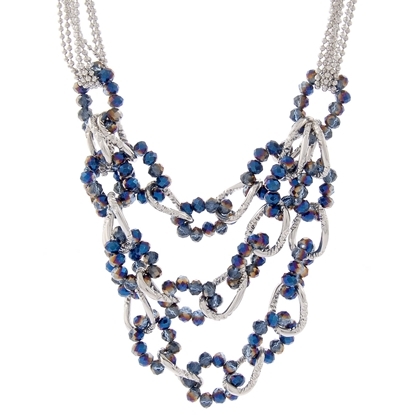 Fifth Avenue Collection’s “Midnight Bloom” neckpiece gives you 24 inches of contemporary style with stunning cable-link chain featuring designer double links. 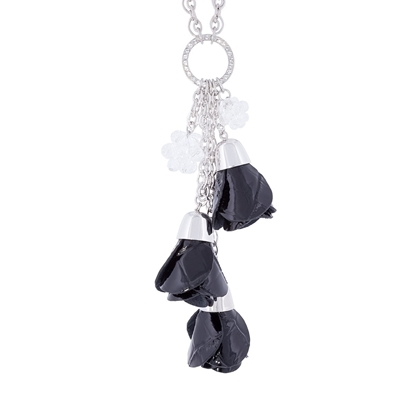 A rhodium-finished circle studded with Swarovski crystals is the perfect bail for two crystal buds and three black leather rosettes, all suspended artfully from varying lengths of chain. 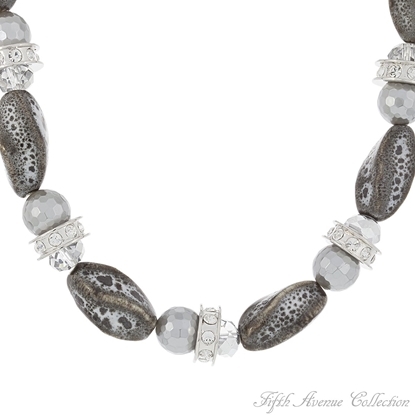 Dramatic and glamorous, cultivate your own fresh style with this unforgettable, en vogue piece. 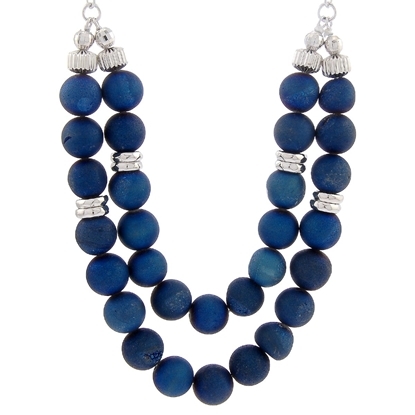 Designed for maximum sparkle our bright and bold "Midnight Blue" neckpiece showcases layers of ravishing rainbow colored beads and rich hematite finished designer chain. 19" neckpiece plus 2" extension. Nickel and lead free jewellery. The promise of fun and adventure awaits the wearer of “Misha”, the golden bear – who sparkles with the beauty of Swarovski’s topaz and Indicolite blue. 16” neckpiece with 2” extension Nickel and lead free. 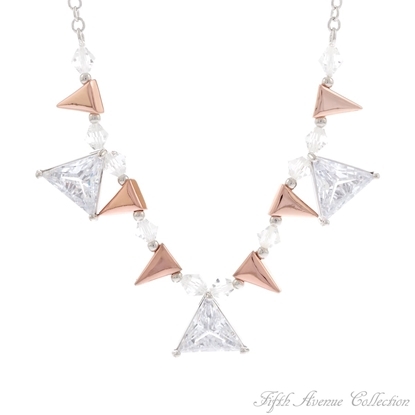 Current fashion combines delicate design with sheer angles, which is what inspired Fifth Avenue Collection to create our stunning “Modern Moments” neckpiece. Suspended from a simple 16-inch, rhodium-finished, cable link chain, contemporary rose gold and cubic zirconia triangles are beautifully interspersed with translucent beads for feminine, yet edgy, style. 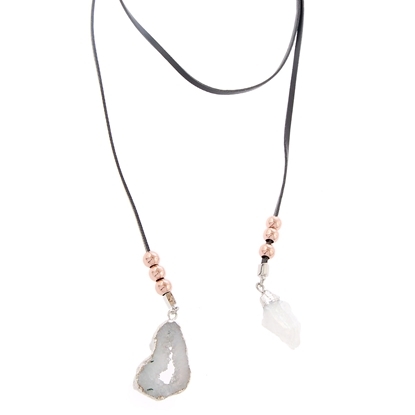 For all those moments when you want your fashion to make a fresh statement, this neckpiece will be your go-to accessory! 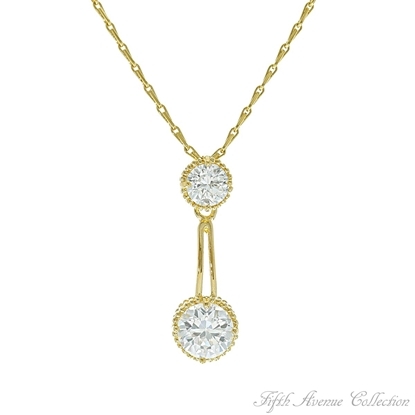 Take a bow Fifth Avenue Collection for this extremely beautiful pendant set with blazing trillion cut cubic zirconia. Is it or isn't it? Not even your Jeweller knows for sure! 16" neckpiece with 2" extension Nickel and lead free. Yes, it's true... gentlemen still exist! Men that give up their seats and open the door for ladies... and that boast about their fantastic moustaches! Quickly grab these gentlemen! 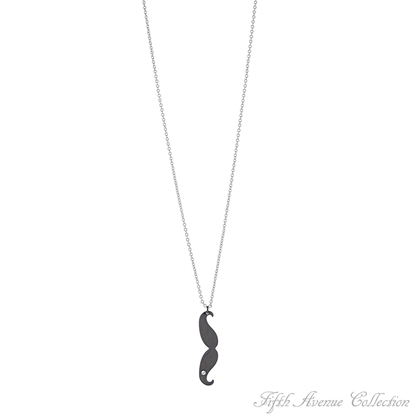 For every "Mr. Moustache" pendant sold, $3.00 will be donated to prostate cancer research to help stamp out this horrible disease. 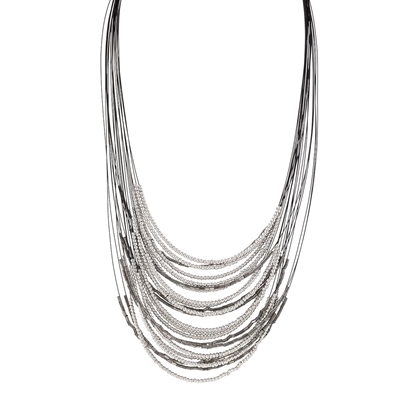 26" neckpiece with 2" extension Nickel, lead and cadmium free.